Deception by CJ Redwine is the second book in the Courier Daughter's trilogy. The first book, Defiance, was a book that I absolutely LOVED when I read it maybe two years ago? And I was always going to be excited to carry on the trilogy. ...It's just taken me a little longer than I expected to do so. 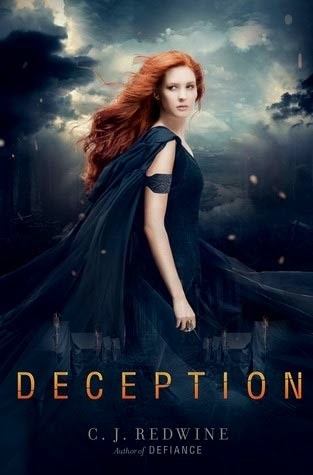 Despite the length of time between reading the first book in the trilogy and the sequel, I didn't find that I'd forgotten that much when I started reading Deception. I felt like CJ Redwine did a great job of creating a memorable world, memorable characters and definitely a memorable scenario that we find ourselves reading about. And right from the first page of Deception, I found it very easy to fall back into this world. And it felt exciting and emotional right from the start. This book will contain spoilers for the first book in the trilogy, Defiance, but will not contain any spoilers for Deception. If you haven't yet read Defiance but are interested in reading this trilogy at some point, I suggest that you stop reading now. Deception takes place right after the ending of Defiance. Rachel and Logan are in the battered remains of Baalboden and it's up to Logan to organise everyone and shift all of the survivors of Baalboden out into the Wasteland and kept safely away from the Commander's army that is chasing them down. He has a plan to ally himself with one of the other city-states but must face new challenges, the pressures of leadership as well as a mole within his straggling band of survivors. At the same time, Rachel is really dealing with the grief over her father and Oliver and also her conflicted feelings over killing a man. These losses weigh heavily on her and at the same time she feels so much rage against the Commander and wants him to pay for what he's done and what he's taken from her and everyone around her. Most of this book is like a road trip story as Rachel and Logan and the others are trying to get from one place to another but with Cursed Ones ready to pop up and destroy everything in sight, an army chasing them from one side, a tracker picking people off from another, dissension in the ranks as well as some hot tempers. What I really loved about this second book in the trilogy is that we see more development of all the main characters, the action is moved along without that much unnecessary drama and we get a bunch more information about the world, the Commander, our main characters and the Cursed Ones. I especially love the elements of technology and of fighting and the ways in which the community of Baalboden change their opinions of both gender and outsiders. Willow and Quinn, the two Tree People that we meet in the first book play a huge part in Deception. Quinn faces a lot of criticism and name-calling from some of the Baalbodens and I loved the way in which she went out about winning them over. And I loved the way in which Quinn's relationship with Rachel unfolded and hearing more about his upbringing and why he has the no weapon policy. I found it all very interesting and I wanted more. This entire book is filled with fascinating people and relationships and I read this whole book wanting more of everything! At the heart of this book, though, is Rachel and Logan. And I thought they were both adorable in this book. Obviously dealing with a lot, but they end up dealing with things together. I love how they both let each other stand on their own and they fight all of the co-dependency issues that most couples in YA succumb to. I absolutely loved this book and this trilogy so far! If you haven't yet discovered this trilogy I really highly recommend them. Ooh, it is! I still have the third book in the series to finish.